Lazulite, formula – [(Mg, Fe2+)Al2(PO4)2(OH)2] is a blue, phosphate mineral containing magnesium, iron, and aluminum phosphate. It is a member of the Phosphate family. It is a magnesium iron aluminum phosphate hydroxide that belongs to the phosphate class of minerals. It forms one endmember of a solid solution series with the darker iron-rich scorzalite. Lazulite is named from an Arabic word for heaven in allusion to its sky blue color. It is an aesthetic blue mineral that forms in distinct crystals. It can be found in Austria, Switzerland, Brazil, the USA, and Canada. Color: Azure-blue, sky-blue, bluish white, yellow-green, blue-green, rarely green. 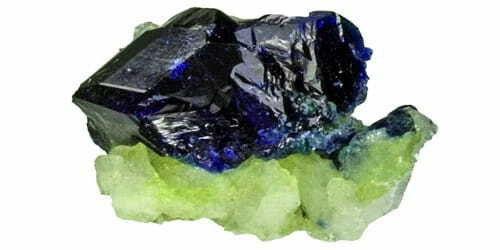 Lazulite crystallizes in the monoclinic system. Crystals are more common than massive forms, but localities with gem grade crystals are scattered and scarce. Crystal habits include steep bipyramidal or wedge-shaped crystals. Lazulite has a Mohs hardness of 5.5 to 6 and a specific gravity of 3.0 to 3.1. It is infusible and insoluble. It forms by high-grade metamorphism of high silica quartz-rich rocks and in pegmatites. It occurs in association with quartz, andalusite, rutile, kyanite, corundum, muscovite, pyrophyllite, dumortierite, wagnerite, svanbergite and berlinite in metamorphic terrains; and with albite, quartz, muscovite, tourmaline, and beryl in pegmatites. 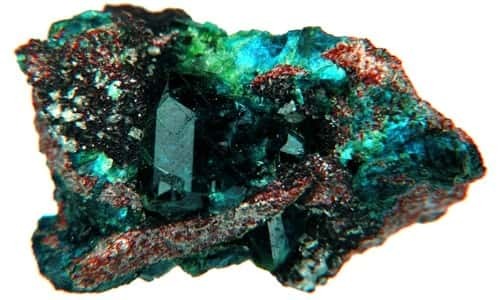 It may be confused with lazurite, lapis lazuli or azurite. It was first described in 1795 for deposits in Styria, Austria. Its name comes from the German lazurstein, for blue stone or from the Arabic for heaven. Association: Quartz, andalusite, rutile, kyanite, corundum, muscovite, pyrophyllite, dumortierite, wagnerite, svanbergite, berlinite (metamorphic); albite, quartz, muscovite, tourmaline, beryl (pegmatites).